This prosperous land has been farmed by the same families for generations. 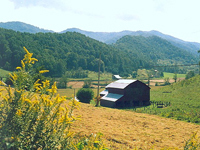 The valley is breathtakingly beautiful, the road winding past fertile fields, big red barns, and small white churches, with the mountains always as a backdrop. 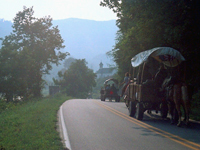 As you drive through Big Sandy Mush, savoring the aroma of newmown hay, you may follow behind a tractor or a farm wagon. You may pass someone riding their horse to work. 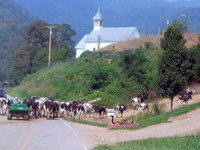 You may be stopped for a few minutes while black and white cows are driven across the road, going home to the barn for milking. And most folks will wave as you go by.